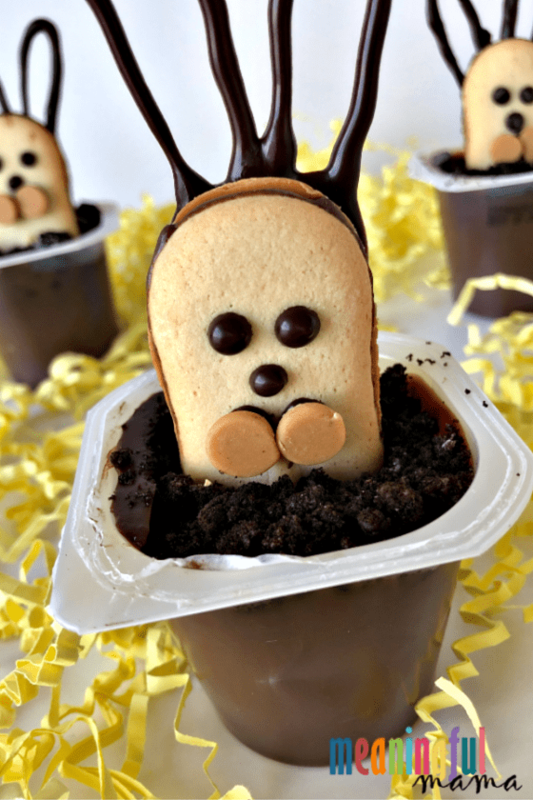 If you are looking for a fun treat or Easter dessert for kids, these Easter Bunny Cookie Pudding Cups are sure to delight. While these are fun and whimsical and perfect for an afternoon treat, you also might want consider these more meaningful resurrection rolls for the morning. 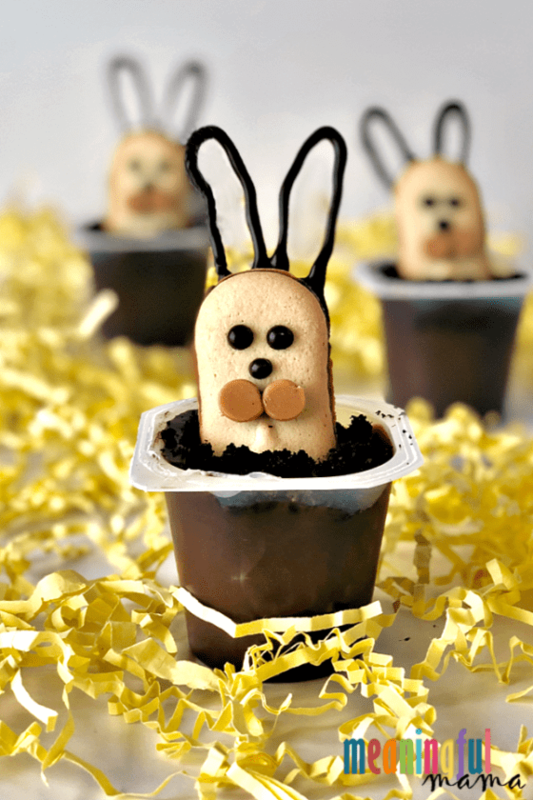 Easter Bunny Cookie Pudding Cups are pretty easy to make. My kids definitely enjoyed helping out. My oldest two could pipe out the ears. Kids of all ages can help do the eyes, nose and bunny cheeks. When working with kids, don’t fret. They won’t be Pinterest perfect. That’s OK. The learning experience as well as the family bonding time in the kitchen is all worth it. Kids gain so much confidence as they learn and grow in skills. Make sure to encourage them, even if their bunny ears are wonky. Once the chocolate face and ears has hardened, kids can help smash the OREOS and then sprinkle the OREO dirt on top of the pudding and stick the bunnies inside. 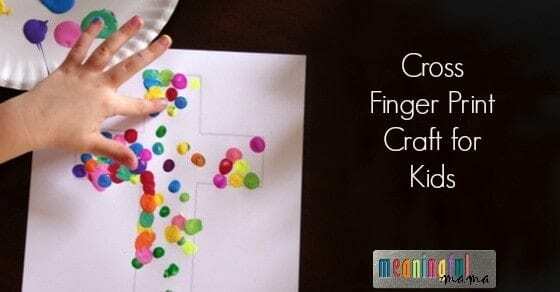 You will notice my own child’s crazy messy hands in the video. As my sensory kid, she had more fun digging her hands in the OREO dirt. It’s so fun to not only have the kids eat the dessert but also help create this special Easter treat. I will provide you with a video tutorial below, but here are the written instructions for your convenience. There is some important advice for piping the chocolate, so make sure to read tip number four for sure. On a blank white sheet of paper, draw out bunny ears in Sharpie. 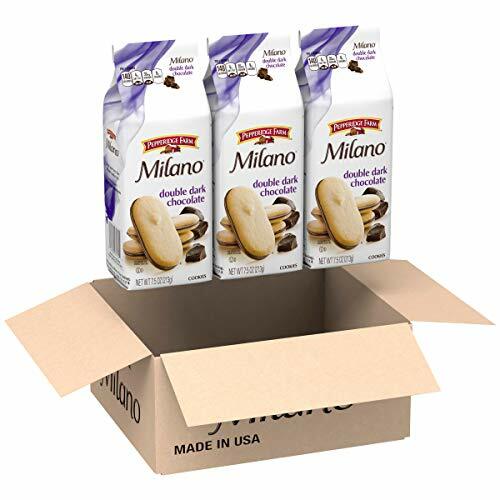 You will want to lay your Milano cookie down and draw them coming out of the top of the cookie so you can get the proportion right. 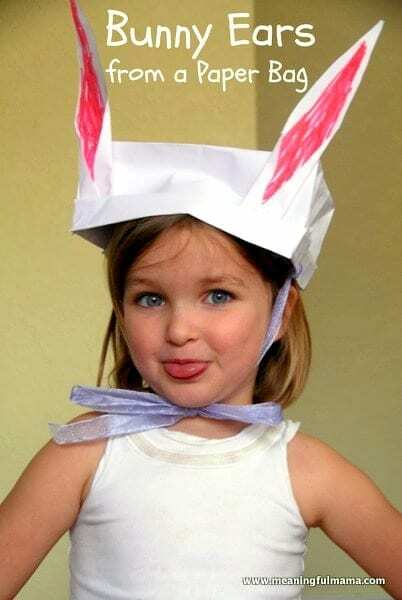 On top of a cookie sheet, place down your bunny ear paper to trace and then a piece of parchment paper. You will be able to see your Sharpie bunny ears come through the parchment. Melt chocolate wafers according to the package directions. Prepare a piping bag with a coupler and tip #2. Do not take a short cut here. Warm chocolate melts and want to run everywhere. You want the coupling (the white plastic bit that fits the tip to the bag) fixed with a small tip to help control the speed of the chocolate. I initially wanted to try it without a coupling and just a small hole at the bottom, but the chocolate was impossible to control. Trace the chocolate on top of the bunny ear Sharpie shapes. 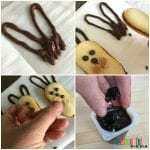 At the base of the ears but still touching add a small pile of chocolate to help affix the ears to the cookie (see instructional picture or video tutorial). Place your bunny on top of the chocolate pile with the ears sticking out. Pipe the chocolate eyes and nose. Add two dots of chocolate where the butterscotch or Reese’s chips will go to make the cheeks. 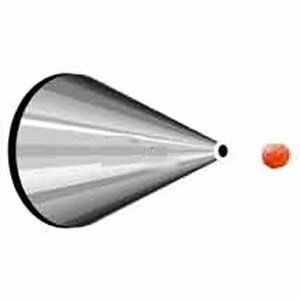 Cut off the tips of the butterscotch or Reese’s chips so they have a flat surface to stick onto the dots of chocolate. Allow chocolate to harden completely. Crush OREOS to a crumb to create OREO dirt. What I love about OREO dirt is that it has the little white specks that make it actually look like real dirt with fertilizer. Just see how it turned out in my succulent chocolate mousse dessert. 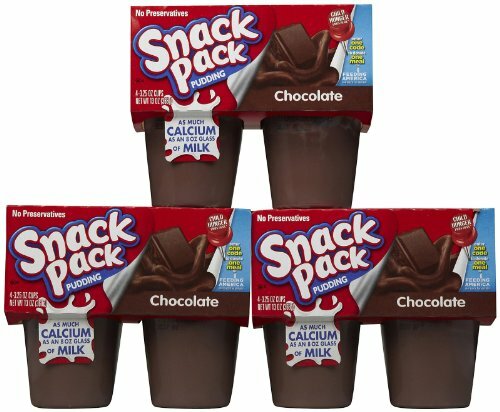 Once the chocolate on the bunny is hardened you can stick the bunnies into the pudding cups. We served these Easter Bunny Cookie Pudding Cups the same day, but I imagine you could cover them and serve them the following day. I love holidays. Give me a theme any day, and I embrace it. Finding special food for the celebration is part of the enjoyment. There is something beautiful about dining with the ones we love. 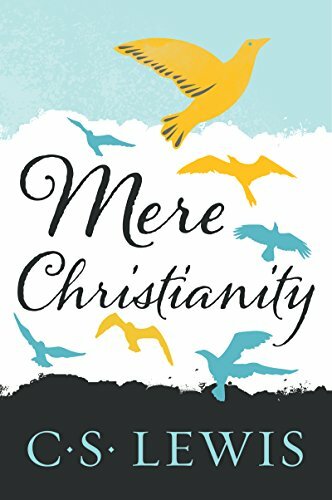 Easter, as a Christian, has so much more depth than just bunnies, chicks and decorated eggs. Without the resurrection our faith would be useless. Unless. 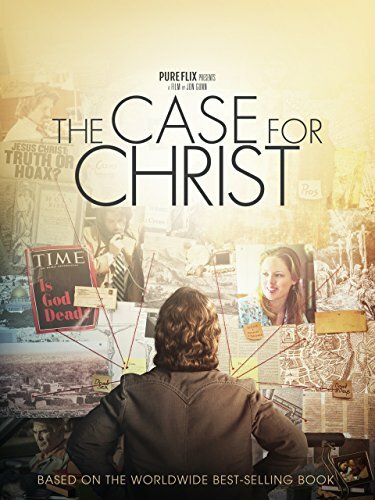 The proofs of the resurrection have been pivotal in keeping me in the Christian faith because I’m a skeptic at heart. 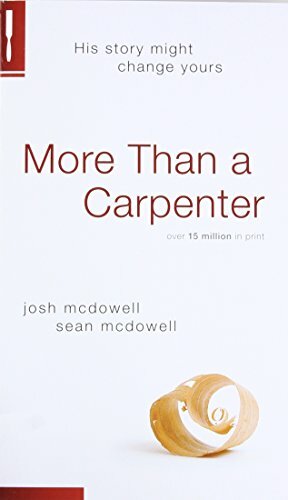 If you haven’t considered it much, I encourage you to look into some books that were influential in my own journey. Determining what you believe about God is the most important decision you will make. 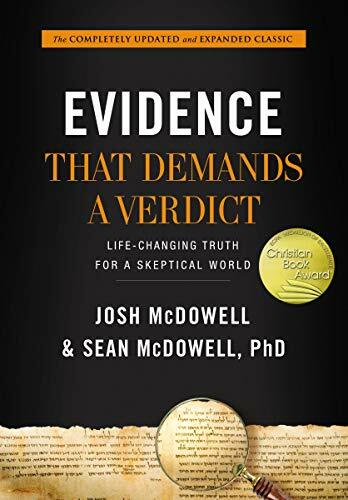 The New Evidence that Demands a Verdict by Thomas Nelson – Heavy read, but good for those who really want to dive deep. These would also be great Easter gifts for those you love that don’t yet believe. Remember that love, service and relationship are the key bridges to be able to give a book like this that will be received well. 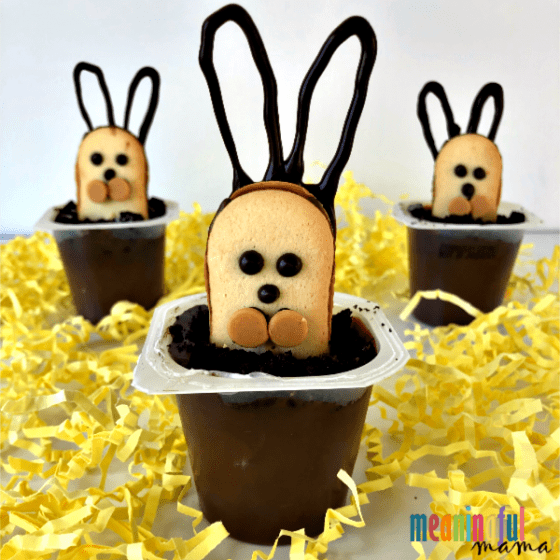 So, while I enjoy celebrating with bunnies like these Easter Bunny Cookie Pudding Cups, I always want to let my kids know and focus on the true meaning of Easter – our own salvation, through faith, because of Christ’s sacrificial death and resurrection. 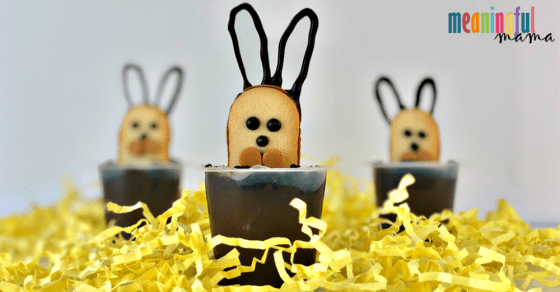 Here’s an adorable, kid-friendly, Easter bunny dessert. 2. On top of a cookie sheet, place down your bunny ear paper to trace and then a piece of parchment paper. You will be able to see your Sharpie bunny ears come through the parchment. 3. Melt chocolate wafers according to the package directions. 4. 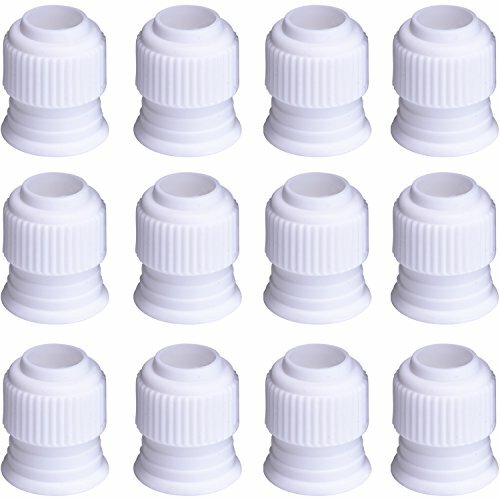 Prepare a piping bag with a coupler and tip #2. Do not take a short cut here. Warm chocolate melts and want to run everywhere. You want the coupling (the white plastic bit that fits the tip to the bag) fixed with a small tip to help control the speed of the chocolate. I initially wanted to try it without a coupling and just a small hole at the bottom, but the chocolate was impossible to control. 5. Trace the chocolate on top of the bunny ear Sharpie shapes. At the base of the ears but still touching add a small pile of chocolate to help affix the ears to the cookie (see instructional picture or video tutorial). 6. Place your bunny on top of the chocolate pile with the ears sticking out. 7. Pipe the chocolate eyes and nose. Add two dots of chocolate where the butterscotch or Reese’s chips will go to make the cheeks. 8. Cut off the tips of the butterscotch or Reese’s chips so they have a flat surface to stick onto the dots of chocolate. 9. Allow chocolate to harden completely. 11. Crush OREOS to a crumb to create OREO dirt. What I love about OREO dirt is that it has the little white specks that make it actually look like real dirt with fertilizer. Just see how it turned out in my succulent chocolate mousse dessert. 12. Once the chocolate on the bunny is hardened you can stick the bunnies into the pudding cups. 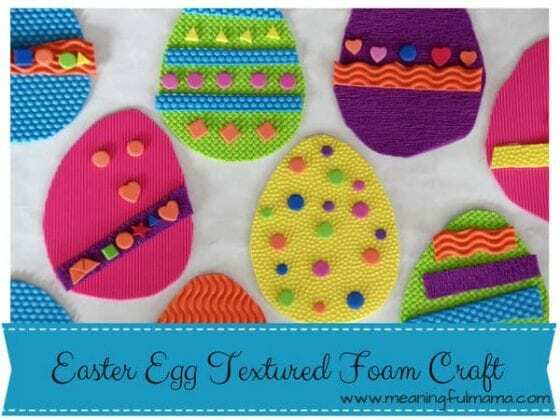 WANT MORE EASTER IDEAS FOR KIDS?